One World Trade Center in New York City is headquarters for a variety of businesses. So, too, is the city of Cleveland… and St. Augustine… and more. Each of these is along the Great Loop, the famous continuous waterway connecting parts of the United States and Canada. 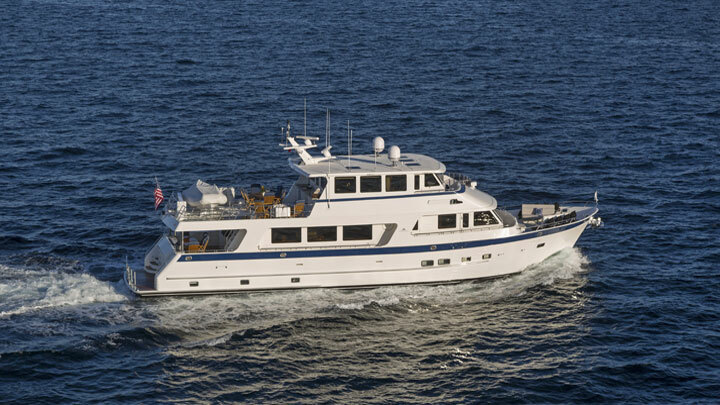 The Great Loop itself is the headquarters, in a sense, for HQ, delivered by Outer Reef Yachts a few months ago. 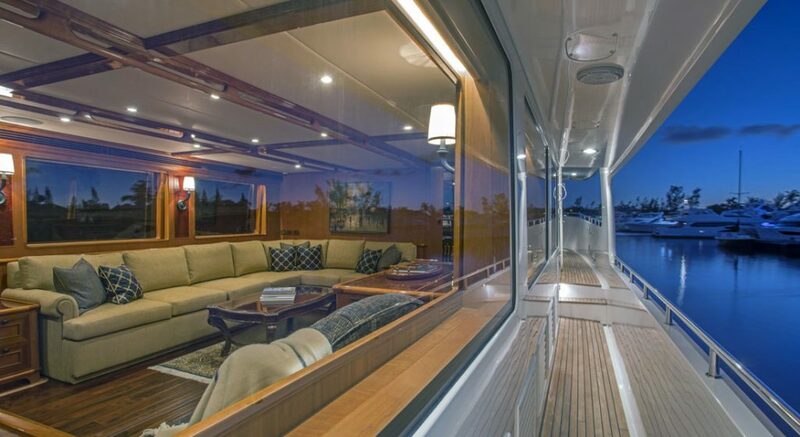 HQ is an 860 Deluxbridge Skylounge Motoryacht, commissioned purposely for cruising the Great Loop. 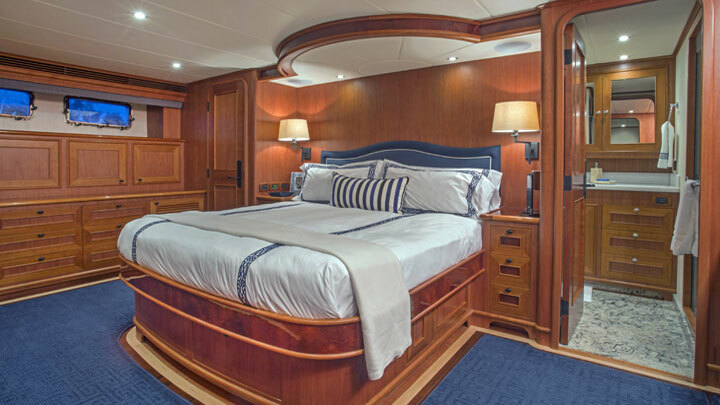 While her owners officially christened her during the recent Fort Lauderdale boat show, they’d already put some good mileage under her keel. 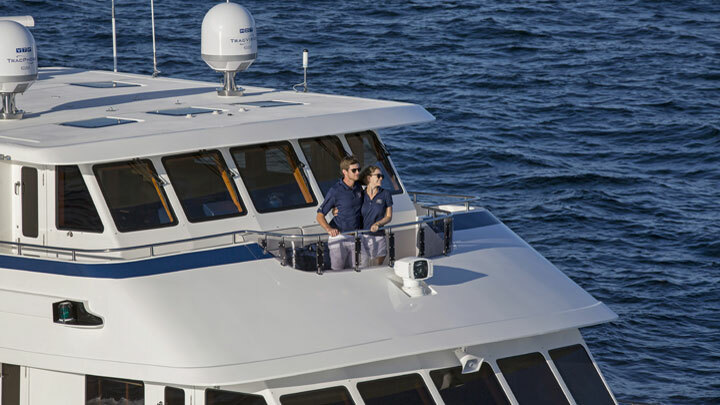 The 86’4” (26.3-meter) megayacht spent the summer exploring parts of the East Coast and Midwest on her first Great Loop trip. If you’re unfamiliar with the Great Loop, it comprises the eastern seaboard, the Gulf Intracoastal Waterways, inland waters like the Tennessee and Mississippi Rivers, and the Great Lakes. It also includes the Canadian Heritage Canals. Since low bridges are along the way, the owners (a.k.a. “Loopers”) asked Outer Reef to alter some things. Specifically, headroom in the skylounge is an inch lower. Furthermore, all electronics up top are removable. The mast lowers, too, flush with the skylounge top. Speaking of the skylounge, it’s a cozy place to relax or enjoy a drink. HQ has a bar aft here to starboard. Yet another bar sits aft to port in the saloon (above), with a nicely lit glassware display. Keeping the skylounge and helm, which are open to one another, nice and bright are three skylights. If you’re getting the sense that HQ has a convivial atmosphere, you’re right. 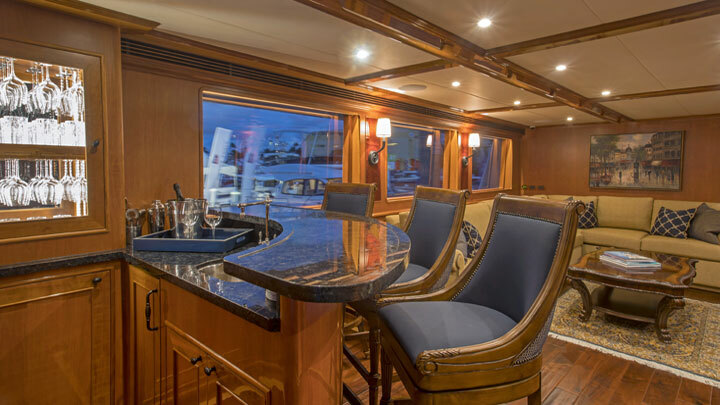 Her ample galley has an island prep area complemented by barstools, even with a dining area tucked forward beneath the ports. The 21-foot (6.4-meter) beam keeps it all feeling comfortable. To keep a still-cozy feel, though, HQ has three staterooms below, including the master. More loops certainly await these Loopers and HQ. It goes to show that these floating headquarters are definitely not all work, and plenty of play. Sometimes there is 20-1/2′ clearance in Chicago at the lowest fixed RR bridge…but not usually. Charted more than one foot less than that. The boat is 20’6” to the hard top when the hard top is cleared. The boat was engineered to transit part way thru the Erie with everything on the hardtop easily removed. We transited the Erie Canal to Oswego and into Chicago. We took advantage of a scheduled construction time on the river when the water was lowered to accommodate needed repairs …that rarely happens. Once under the one fixed bridge the rest was easy. I would look really good on that boat!